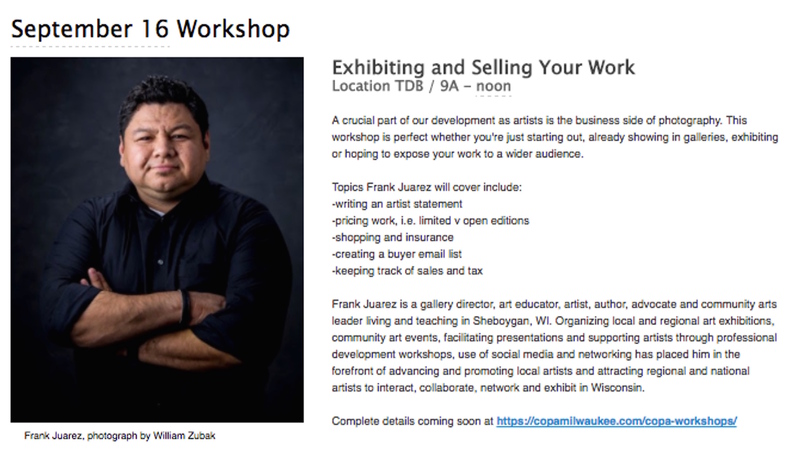 I am looking forward to facilitating a presentation focused on exhibiting and selling art this Fall. Check out these upcoming CoPA workshops. The Coalition of Photographic Arts was founded in 2004 by a group of Milwaukee area photographers passionate about sharing their skills, experience and enthusiasm for the medium. Working with students, beginners, other professional photographers, ardent amateurs and artists, our founders explored fine art photography from an aesthetic, technical and developmental perspective, which remains the foundation of CoPA’s mission. Today, the fine arts photography organization carries on our founders’ vision of promoting photographic excellence through educational programs, lectures, panel discussions, workshops, field trips and Milwaukee photography exhibitions. CoPA forges relationships within the photographic community and the arts community as a whole through monthly meetings, portfolio reviews, museum and gallery tours, juried member exhibitions, sponsored events and much more. CoPA is directed by a member-elected board focused on developing member experiences that will give photographers at any level the tools they need to advance to the next level and to remain curious, invested and exhilarated about photography and its possibilities. Our membership of nearly 200 includes artists, students, professionals, amateurs, enthusiasts and collectors. CoPA is a 501 (3) (c) non-profit fine arts photography organization.